The Syndicate of Musical Professions bans Mashrou’ Leila from performing in Egypt following Music Park concert, held in Cairo on 22 September, where the crowd raised the rainbow flag in support of the LGBTQ community in Egypt. The Deputy of the Syndicate of Musical Professions Reza Ragab said, in an interview with TV host Mahmoud AbdelHalim on AlAssema channel, that the syndicate decided to ban any upcoming concerts for Mashrou’ Leila band. While the role of the Syndicate of Musical Professions is “not restricting”, says Ragab, we prevent such bands and musicians from getting on stage because they perform “abnormal art”, he adds. Mashrou’ Leila is a six-member band that fuses the craftiness of a music workshop with the punch of stadium rock. They performed live in Lebanon, Cairo, Amman, Istanbul, Dubai, Tunis, Paris, Amsterdam, Montreal, Geneva, Serbia and international festivals such as Byblos, Baalbeck and Exit among others. Mashrou’ Leila band has been previously banned from performing in Jordan. 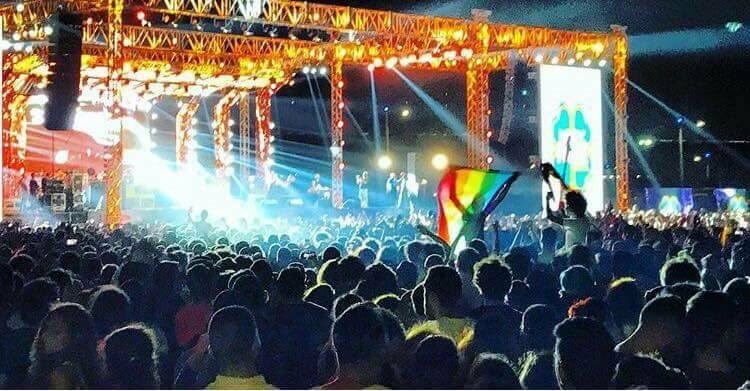 This is not the first time someone raises a rainbow flag in Mashrou’ Leila’s concerts in Cairo. In 2016, Mashrou’ Leila held a concert at The American University in Cairo (AUC) when one of the fans gave a shout out to the band raising the flag. The lead singer of the Lebanese indie band Hamed Sinno stressed on how proud he was and how much courage it must have taken for the fans to raise the flag in Cairo.